frankly my dear...: Made for Mumma. Whilst i was browsing in my favourite clothing store recently, i saw this top & very nearly purchased it, then on a second thought i said to my sister "I could so make one like this!". 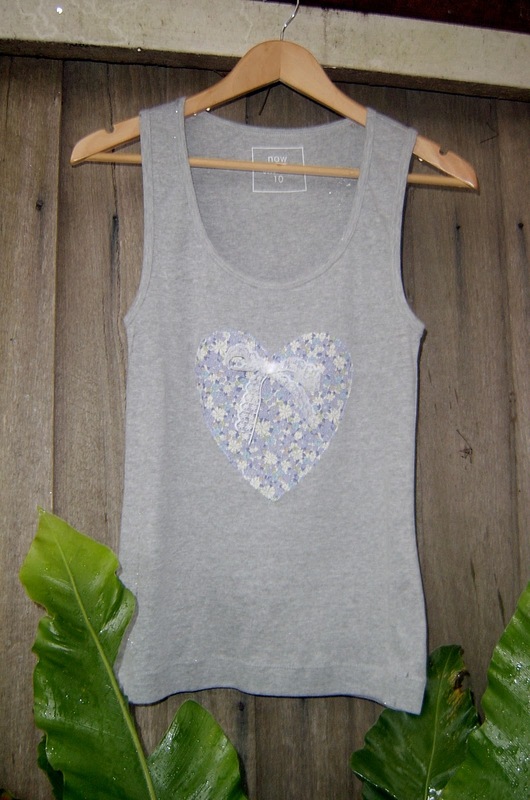 So off i went to Kmart & bought myself a good old five buck tank. Luckily i still had enough of that lovely Japanese cotton leftover from Scarlett's dress for the heart & some lace in my stash. Honestly it probably took me a whole 15 minutes to make..........and it sure was a heck of a lot cheaper! I love it so much! And i especially love that i got to choose my own colour scheme. When Amity arrived home from school, she was upset because apparently i don't make anything for her anymore.............so now there's a smaller version sitting on the table ready to be stitched. love it! can't wait to see the little version.